Invention and innovation is what makes America great. The ability to see a problem, work towards resolving it and sharing the resulting product with all of mankind is why I fell in love with entrepreneurship. It's about the constant pursuit of pushing mankind forward that makes me feel all gooey inside. Thanks to crowdfunding platforms like Kickstarter and Indiegogo, anybody with a good idea and enough backers can bring their invention or innovation to the market. This makes me so happy to be alive right now. Just seven years ago this wasn't possible. Before crowdfunding, if you had an invention you had to go through the tedious process of raising capital from investors or licensing your patent to a larger business to bring your product to the market. This was a tremendous risk because without sales an inventor wasn't able to prove the concept. Thanks to crowdfunding that's all changed. Innovation is a word that describes the 3rd most funded Kickstarter project most appropriately. It's also the coolest Kickstarter project ever. The Coolest is a multi-purpose cooler developed by inventor Ryan Grepper. "Ever since I can remember I've noticed inefficiencies and had fun thinking about how I might solve those problems. I've always viewed the world through that lens. My two biggest loves are spending time with family and friends and the great outdoors. I've used coolers my whole life and this product is everything I wanted in a cooler. It was a personal passion. I loved it myself and then when I started showing it to friends and family they had such an enthusiastic response that I thought I might be onto something." The Coolest is unlike anything you've ever seen. It's the Swiss Army knife of coolers. This cooler has everything! Beyond the allure and "cool factor" of the Coolest, I was even more intrigued by Ryan Grepper and his story that brought the Coolest from a simple idea to becoming the 3rd most funded project on Kickstarter. What's even more interesting is that the Coolest almost didn't happen. It was initially launched on Kickstarter last November but failed to meet its $125,000 goal. It missed the mark by $22,812. As of the writing of this article the Coolest has raised $8,286,568 proving that if at first you don't succeed, you can dust yourself off and try again. Icanbesociety.com chronicles the stories of Internet elite's like Ryan Grepper, who have turned their passion into a lucrative business. I had the opportunity to interview Ryan, where he shared his story and encouraging words of wisdom for aspiring inventors, entrepreneurs and crowd funders. What were your business goals and objectives for your Kickstarter campaign? "I simply wanted to reach my funding goal of 50,000 dollars. That was what I considered the minimum amount I'd need to move the idea forward." Why did you decide to seek funding on Kickstarter as opposed to seeking funding from investors or other more traditional sources? "Kickstarter, and crowdfunding in general, offers great opportunity for creators and inventors. The traditional model often involves ramping up for production before a single sale has been made. Kickstarter allows you to minimize your risk and place your idea directly before your potential customer much earlier and for less cost. If enough people are willing to vote for your idea with their wallet you know that there is real interest in your concept. If you don't hit your goal you can either re-evaluate and adjust as I did after my first Coolest campaign or move on to the next idea." Many crowdfunding campaigns have difficulty gaining traction. Did you do any marketing or promotion to draw more traffic to your campaign and what do you think is the most common misconception about crowdfunding? This is actually my second Kickstarter campaign for the Coolest. When I launched my first campaign for the Coolest last November I thought that if you started with a good enough idea people would find it and success was inevitable. Perhaps many people may feel that way. When the campaign failed I took a hard look at what went wrong. I did not give up. I saw that there was interest and I hoped that with a few strategy changes the Coolest could be a success. 1.) Kickstarter is a very visual medium. I needed to advance the design of the Coolest prototype to best showcase my vision. I advanced the design and am thrilled that folks are connecting with it. 2.) Time of year really does matter. It sounds obvious now, but launching a product when backers are most likely to be receptive makes a difference. I thought we could appeal to tailgaters and Christmas shoppers in November, but that did not work. Re-launching in July has been perfect because people are in the frame of mind to consider a cooler. 3.) It's critical to develop a following before the campaign. I was encouraged that there were people who showed interest in the Coolest and we worked hard to nurture and grow that excitement in between our first and current campaign. By the time we launched we had a core group of interested backers and I can't believe how that excitement has grown. I am beyond grateful for every single backer. If Kickstarter or a similar crowdfunding platform like it didn't exist, how would this have impacted your ability to bring the Coolest to the market? "Crowdfunding allows inventors to test their ideas quickly and see if they resonate with potential customers. 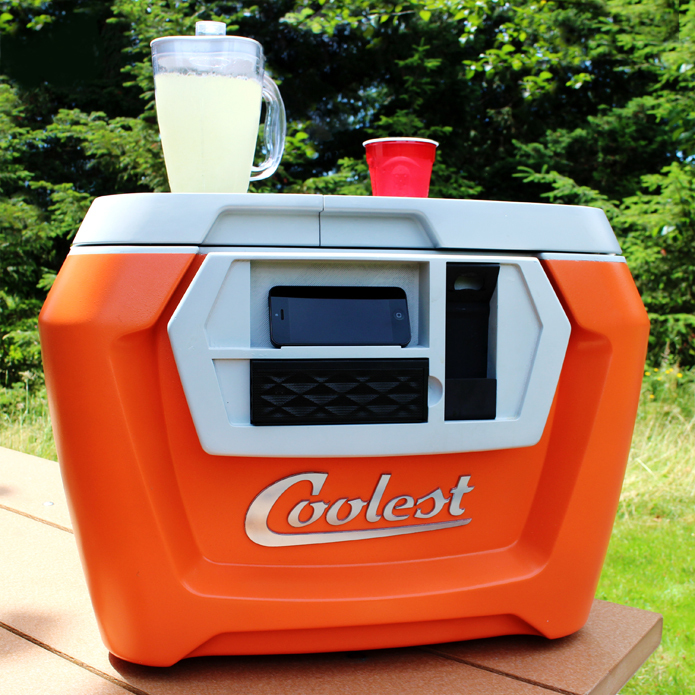 Without crowdfunding I would likely have tried to approach a large company to license it from me, which would have been a real challenge without proven customer interest in this new category of a cooler. I likely would have just enjoyed my personal prototype and moved on to an easier invention to license." Michael Price is an entrepreneur and author of What Next? The Millennial's Guide To Surviving and Thriving in the Real World endorsed by Barbara Corcoran of ABC's Shark Tank. An advocate of ideas for radical change, he has received critical acclaim for his lessons in education, career, entrepreneurship and personal finance.